Traveling to exotic locales is all well and good, but, well, frankly it can be expensive, annoying, and these days, downright dangerous. One thing adventure/hidden object hybrids do very well is transport the player to far off places, some that they'd probably never get to see in real life. The Dark Hills of Cherai is no exception. Created by ChaYoWo Games, The Dark Hills of Cherai take the player to the mysterious jungles of southern India in search of a cursed treasure. Our tale begins as four young cousins visit their grandmother in the village of Cherai. She delights them with stories of a local treasure-hunter, Wyatt, who recently found something but succumbed to the accompanying curse. The children thrill to the story of the former King of Cherai and his treacherous court magician. The children go to sleep, visions of treasure, dark sorcery, and murder ringing in their heads. While it is still dark, the oldest, Tara, awakes to find young Arjun missing. Knowing that he has probably gone to find the treasure, she sets off on a quest to track him down before trouble can find him. Too bad that it's too late. Yes, this sounds like the opening of a thousand other adventure/HOG hybrids. However, once Tara reaches the snake temple and can go no further The Dark Hills of Cherai hits with a rarely used game dynamic: multiple playable characters. As Tara contemplates what to do, another cousin, Rahul, wakes up to find them missing, and sets off on his own quest to find the missing relatives. Eventually, the last cousin at home will also set off (with Grandma in tow) in yet a third direction. Each child will find pieces of the puzzle, but it is only when they combine their efforts that they will manage to find the missing treasure, cousin Arjun, and the evil magician who has kidnapped him. Gameplay is simple and is accomplished with the click of a mouse. The cursor will change to arrows and text indicating a location or simply "path ahead" to let the player know which way they can go. 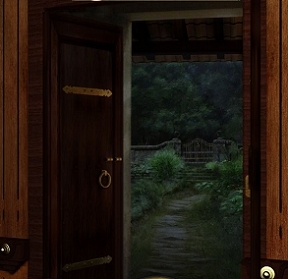 As the player enters the scene a list of hidden objects will appear that need to be found before you can continue. Some objects will go into the inventory for use either within that area or later in the game. Showers of sparks denote areas that require some action or which involve mini-games. And there are a lot of mini-games to be had. Gamers can clear the scene and receive a "magic herb" or can move along without completion, but you will have to come back eventually to find everything there is to find. There is a hint system for the hidden object scenes, with a timer that refills slowly and a skip button for the puzzles, also with a slow filling timer. You can play in easy, untimed mode for relaxed casual gameplay, or a timed "advanced" mode that can be more difficult. The easy mode includes a friendly ghost who will give you hints and help you along the way. One of the coolest aspects of The Dark Hills of Cherai is the different playable characters. Each child is finding useful objects, not perhaps useful for them but for the other children. This necessitates all the characters finding the "meeting place", a point central to each of their journeys, where they cannot see each other but can swap objects blindly on a rotating merry-go-round. However, each character has to find the meeting place, which can be tricky. Once the characters have the items they need they can go back and proceed along their own journeys. Switching between the children is simple, bars at the top indicate the cousins so just click on the bar and you are ready to go. Play one child for a while or switch rapidly back and forth between them, it is up to you. Eventually everyone will meet up in time to challenge the evil magician and rescue poor Arjun. Analysis: What sets The Dark Hills of Cherai apart from the multitude of adventure/HOG hybrids? First is the location. 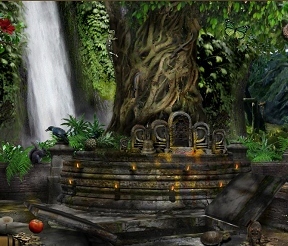 Created by ChaYoWo Games, an Indian company, the game authentically recreates the lush landscape of southern India. Little touches everywhere add to the illusion, from the water buffalo grazing in the front yard to the elephant hanging around by the kitchen door, and the multitude of other local fauna scampering across the screen whenever you reach a new location. The background artwork is magical, so realistic you can see the grain in the wood and the veins in the leaves. Each journey is also appropriately lit: Tara wakes before dawn, so most of her scenes are dark and gloomy; Rahul awakes at daybreak, and you can witness the light of early morning in his quest; Maya and grandma set off when the sun is high in the sky, and their scenes are bright and washed with light. The little animations in each scene add to the feel of really being there, without the actual heat, humidity, and bugs. Rounding out the experience are lovely incidental sounds and music which capture the mood and the place. The hidden object scenes are done beautifully. Rather than go for the "pile 300 objects in a small space and make you find the objects", The Dark Hills of Cherai opts for the more subtle placing of objects so carefully that they are swallowed by the stunning backgrounds. Warning, though, you will encounter more than one scene with a lot of wildlife. Hope you can tell a myna from a blue kingfisher, a crow from a lovebird. There are also a few "Britishisms" in the lists, calling a wrench a spanner or glasses spectacles. The best part about The Dark Hills of Cherai are the mini-games. There's nothing terribly new there, but there are a plethora of games to satisfy the adventurer. Nearly every scene includes at least one puzzle, and there are a lot of scenes in this game. From pipe puzzles to sliders, from tile swaps to jumping peg puzzles, from untangle puzzles to the classic Towers of Saigon, ChaYoWo has thrown everything into this game but the kitchen sink. There's even an avoider maze puzzle late in the game which can be exceedingly tricky. Some of the objects are, well, a little too well hidden, making them almost impossible to find without hints. Several of the mini-games are color-based puzzles, making them difficult if not impossible for those with color-blindness. And the helpful hint system is sometimes a little too helpful, even in "advanced" mode. The game's habit of letting you know precisely which child needs the item you just found can be annoying to experienced gamers who would like to figure that bit out for themselves. Taking each of the children to the "meeting place" means a lot of backtracking, although once they leave you can use the handy map feature to skip them back to their previous positions. Minor flaws aside, The Dark Hills of Cherai is beautiful, fun casual gameplay. Fantastically, it bucks the latest trend of the ever shrinking game time and will keep players busy for hours. This is not a game to speed through. Take your time, explore, and experience the wonders of India without ever leaving your home. The Dark Hills of Cherai Walkthrough now available! Click on butter churn. Match the shapes to the number on the churn. In Wyatt's Bedroom, Click Cabinet to open puzzle. Simply line up the rings so the numbers are aligned like a clock face then turn the hands on the dial below to the numbers according to the color shown above. Use Crowbar on ceiling and pick up Eyeball. At Wyatt's Back Door, use Key on lock. You can always solve the puzzle in 3 turns. Look at the blue edges as a clue. Rotate the squares which move the blue outline first. Use Key on bottom drawer beneath puzzle, pick up Cat Food and give it to the cat, Pick up the paper. Once at the Forest, shoot the target. With 4 knives you have to score 140. Start your knives near bottom of the screen and in the center. Place Snake Idol on rotating table then turn the table to the left to pass it to Tara. In Grandmother's Bedroom, click Puzzle. pick up Red Gem. Give Shovel to Tara, then give Banana to Tara. Get Wooden Plank and Eye from Rahul. Pick up the White Gem. After you find all the objects at the Castle Gate, you will have to connect the pipes in the puzzle. Not all pipes need to be used. It is a little hard to see but you need to connect from the top left to the bottom right. At Basil Platform, use Watering Can on the platform to trigger the puzzle. Note: Don't forget to click on mandala on the lower part of the wall! Click cave puzzle. All you have to do is fit all the pieces in the bird outline. Hint: begin with the largest pieces then fill in any spaces with the small triangles. Use the round "table" on the bottom to rotate your pieces. Pick up Green Gem then use Hook (Anchor) to climb out. Return to Wayside Shed and use Key on Box to pick up Green Gem. Go to Bridge and use Wooden Plank to cross water. Go to Cave to open puzzle. Puzzle help: Pull all the circles as far out as possible, then find the ones with the most intersections and move them around until they are all grey. In the Valley, don't forget to press the mandala on the bottom. At the Castle Gate, put 2 Eyes into owl. Return to Meeting Place and get third and forth eye from Tara. Return to Castle Gate and place other two Eyes into the owl. Open Castle Doors by moving stacks on right lock to the left lock on at a time. You can use the lower lock as a holder. Inside Magician's Bedroom, use Scissors to cut the bed and pick up the Key. In the next room, put the objects in the goddesses hands in the proper places according to how she is holding her hand. Pick up the Pink Gem and return to Meeting Place. Return Castle and enter Room of Prisms. Place triangle prisms. If the laser hits the point of a triangle, its light will spread to each side. You must light all the squares. Note: the light will pass through the squares that are lit. Return to Abandoned Well (don't forget to click on oval mandala on wall) and go through door to Riverside. To do puzzle, find all the shapes in the image that are silhouetted above. Pick up Orange Gem then return to Meeting Place. Get Ladder from Tara and return to Valley. At Castle Gate do Oil Puzzle. You must pour 6oz of oil into the center. You are given one jar which is full of 7oz, one empty 19oz jar and one full jar of 13oz. 1 - pour the 7 into the 19. In the Throne Room, don't forget to find the mandala and click it! Return to Meeting Place give Tara the Magic Disc and get the Key from Maya. Return to the Castle and use Key in the chest. Don't forget the numbers on the note! In the Room of Darkness, use your Flashlight (Torch) to light the maze in front of you. Hint: Use the TOPS of the maze walls to guide you through, not the floor. At the Door put the three Magic Discs on the door then turn them until the patterns match. In the Castle Visiting Room, don't forget to click the mandala! At the Castle Library, put the blank piece of paper next to the lamp. Decode the note by matching one letter to each letter in the note. Each letter stands for a different letter. Open chest to the right and pick up the paper. Remember the numbers on the paper! In the Room of Patterns, match the patterns on the rotating floor. It's easiest to start from the largest ring and work your way in. In the Chamber, place 8 pieces of parchment into the book matching the color of the pages. Put the 9 gems into the proper places on the statue according to their colors. Cherai is an actual place in the South Indian state of Kerala. 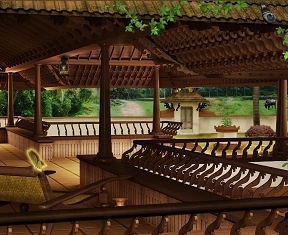 The art and environments used in the game are pretty accurate representation of traditional houses in Kerala. A must visit place. I bought this game a week ago. It's very well done though it does eat up ram. I like the 3-person interaction at the Meeting Place. And I like the fact that you get from Grandmas' house to the Magicians' house in 3 separate stories from 3 different vantage points. The HO elements are a mix between logical placement and pie in the sky. That's fine with me as that pie in the sky seems to be the norm. Some minigames were easy peasy, others were tough as nails, had to skip. Definitely well worth buying. 3 out of 5. Nice plot with the 3-characters interaction, good graphics, no challenge whatsoever. The trade items system is also boring. I recommend "Value for Money game" ! It's kinds annoying having to backtrack to the meeting place every once in a while. I'd be nice to have a map that instantly transport you to a place you want. I am stuck because I didn't get the jewel from the partially hidden idol at the riverside. Played the mini-game but it didn't register that I got the jewel. Can't click on it any more. Can't progress to final meeting without it! Do I have to start over? Hope someone has a fix!